Fall Fun in the Art Room! 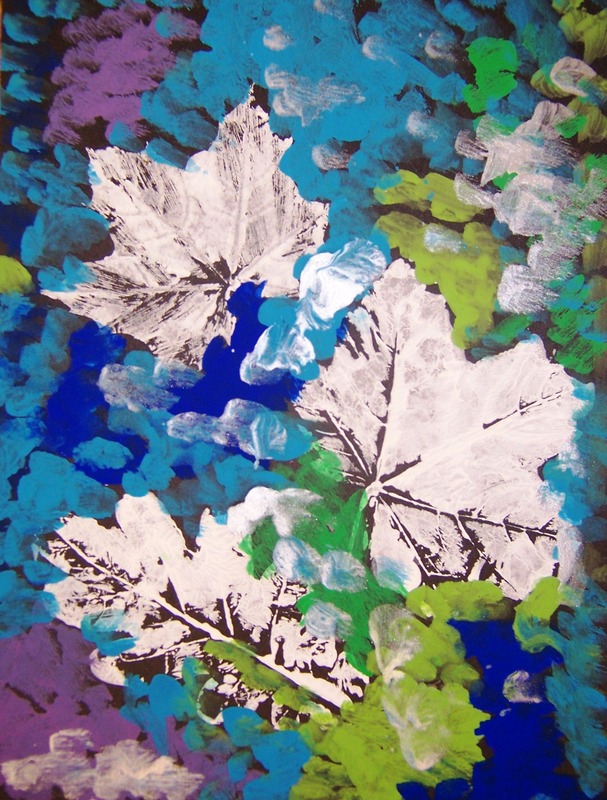 These beautiful leaf print/paintings were made by first graders! They loved the process and we all loved the results. 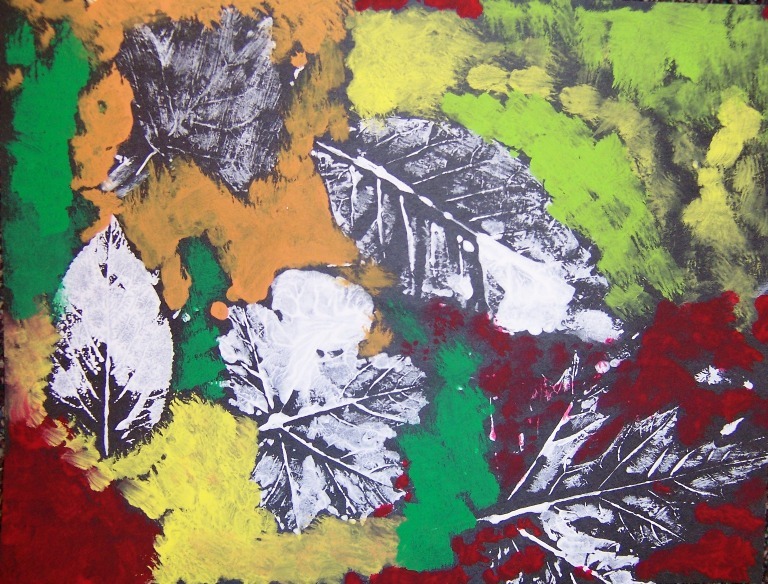 Materials: Black construction paper, whiter tempera paint, fresh fall leaves, tempera paints in a variety of warm and cool colors. Day one: students printed the leaves on the black paper, by painting the bumpy side of the leaf with white paint, setting it down gently, and pressing onto the paper. We let the prints dry. Day two: students chose a warm or cool color scheme. Then we got to work painting. We used big brushes and sort of dabbed our way around the leaves. Kids did not wash brushes, just let the colors blend between color changes. Comments from students: “I feel like a real artist” and “My leaf looks like an x-ray”. 9″ x 12″ white construction paper, pencils, tempera paint in the following colors: yellow, green, blue, orange, yellow, pink, violet, and white – we discuss a “clear” palette similar to the one Monet would have used, paint brushes, and ragged edged torn sponges. They LOVE this video and I highly recommend it! 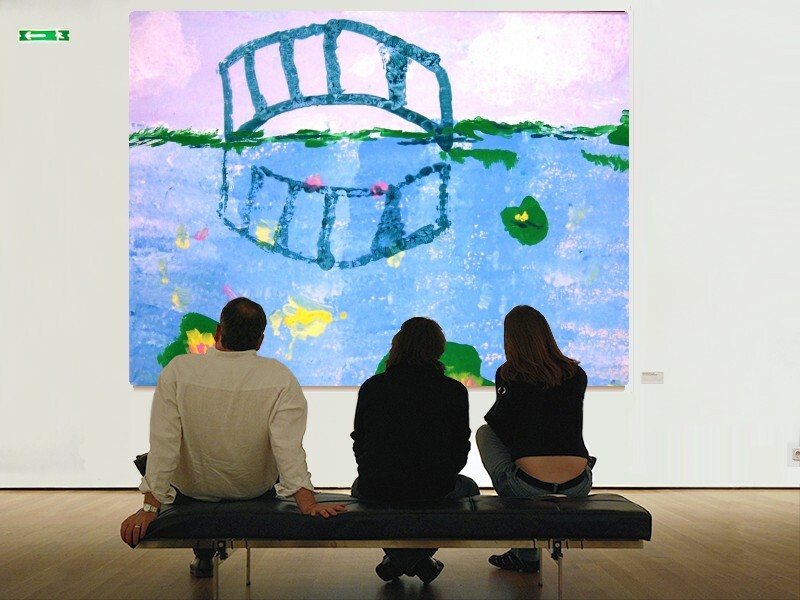 It tells the story of a little girl who travels to Monet’s gardens. It is animated with shots of the real gardens interspersed. There is a book version, but the video is so much better! Hand out white paper and pencils. Pencils are for name and other information on the back. Have students fold a horizon line across the paper. Put out some white and shades of blue and violet tempera in a tray and have students “hop and dab” their big brushes from the the horizon line and up to the top of the paper. I remind them that they do NOT want the entire area solid. Some white showing through is fine, as are flufffy white clouds. Also, remind them to keep the sky light. Add some blue green and darker blues paint to the tray and have the students repeat step 1 from the horizon line down. Add some bushes above the horizon line, using the sponge. I have the students leave an open area for the Japanese bridge. Put some thinned down turquoise paint (the bridge could be any other color) on a plate and show students how to paint a rainbow line. Jump the brush down and paint another rainbow line. Then they add the vertical lines that create the railing slats. This step needs to be done quickly. This is the magical step for most students. They refold their paper and gently press. When they open the paper, they’ll see the reflection of the bridge! Put some blue and white paint in a bowl, side by side. I tell the kids NOT to mix the colors. Rather, they pick up a little of each color to paint the pond. I have them make “waves” in their pond by making small brush strokes. By not mixing the blue & white, they get the effect of the light hitting the water. While the pond dries, I show the kids examples (photos) of lily pads and water lilies. We also discuss that we are seeing the side of the lily pad rather than the top, so the shapes will be a flattened circle, or ellipse. They then add about 3-5 lily pads to their ponds using two colors of paint. They also add some small flowers to their gardens by dipping the WRONG end of their paintbrushes in various colors of tempera and then dabbing them on the paper. I place some yellow, pink, and white paint in a cup and demonstrate how to make the water lilies. 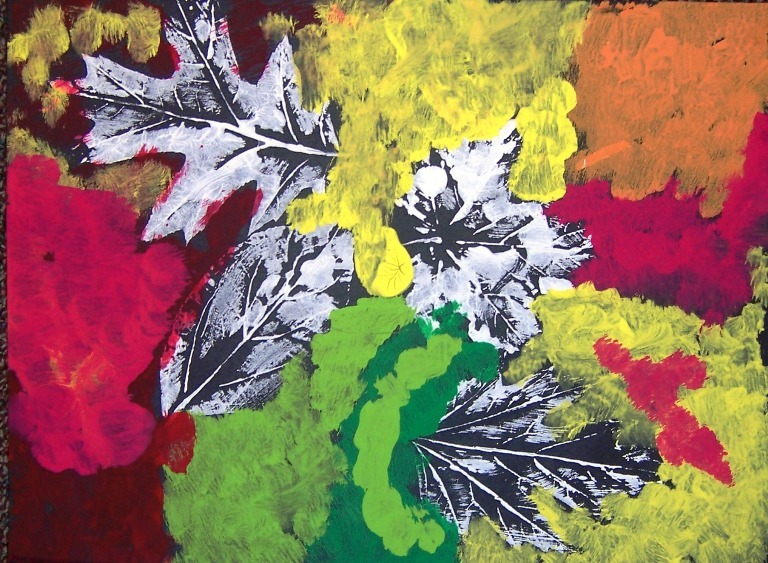 Have the students dip their brushes in all three colors (without mixing them all together) and then make four brushstrokes as drawn in the diagram, making sure that the strokes connect at the bottom to form the flower petals. Enjoy Susanna’s gorgeous garden. Monet would be proud! Taken from an observational drawing, the image is transferred to cardstock, cut out and glued onto a heavier surface, such as mat board. 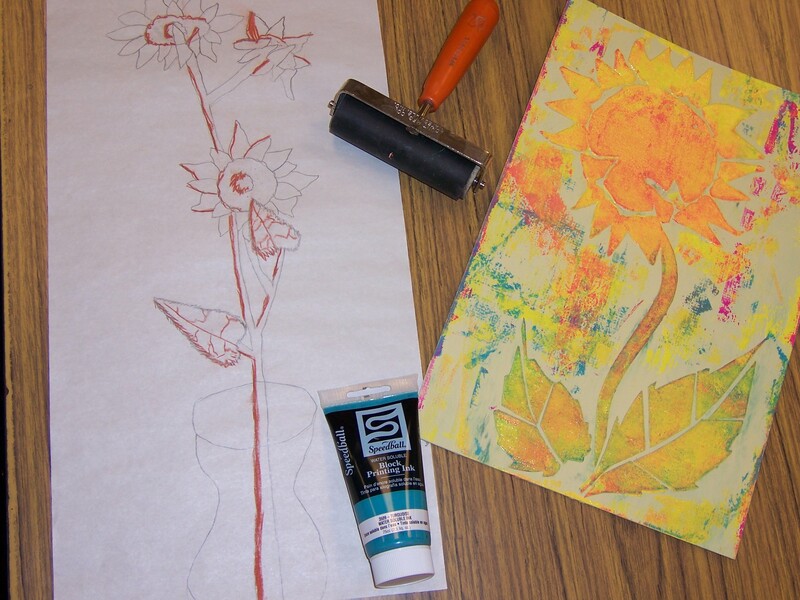 The collaged printing plate is then gessoed and inked with yellow water soluble printing ink. We use a baby press to print the image. Additional primary colored ink is added to mix and create secondary colors. 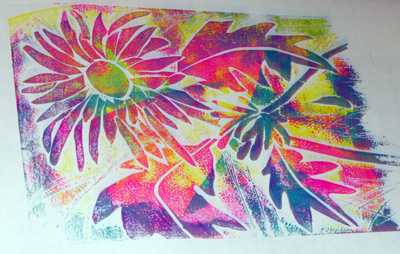 Final image and print by Woody.